Thunderstorms feature regularly in the skyline over the highveld in Johannesburg and if you ask any Capetonians who once lived there what they miss about Johannesburg, I can assure, as an ex Gautenger myself, they will admit not much, except for the spectacular weather phenomena that is the thunderstorm. I was fortunate enough to experience this amazing force of nature a few weeks ago, along with two International Fund for Animal Welfare colleagues during an outreach clinic with the Community Led Animal Welfare (CLAW) veterinary team. This particular settlement is located in the Magaliesburg. With the majority of the resident companion animals already having been sterilised, CLAW’s regular outreach work in this community now mainly concentrates on preventative treatments. 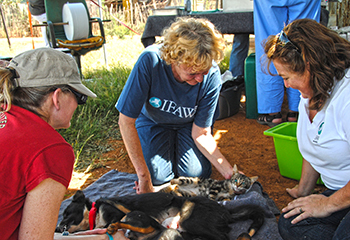 An adjacent community, keen to have their animals sterilised, resulted in Cora and the CLAW vet team visiting the settlement where about thirty dogs and cats were sterilised on the same day and. In fact, the numbers would have been higher if it were not for “operations” being disrupted due to the sudden onset of precipitation which gave new meaning to the words “the heavens opened”. Storm clouds which had been gathering all morning made good on their threats and caught everyone by surprise, sending the team, residents, dogs, cats, turkeys and chickens scrambling for cover. 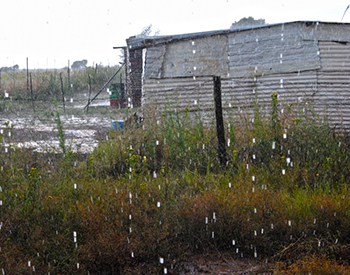 Great big drops of rain hitting the ground, bouncing off the earth like ricocheting bullets and causing a deafening noise inside the shacks where most of the team took cover. Once the storm had past and mopping up operations began, residents were informed that the remaining animals would be sterilised during CLAW’s next outreach clinic. In total on this day, the clinic sterilised 30 dogs and cats with the procedures performed by CLAW’s permanent vet Dr Saskia Karius and longtime volunteer vet, Dr Jette Schoenig. The team also distributed chocolate eggs to the youngsters and clothing donations to many adults and children who had gathered to witness the day’s goings-on. All this support is greatly appreciated and always a highlight for the residents amidst the realities of living life one day at a time. Your support makes our efforts in South Africa a reality, consider a donation now.